of every school year." 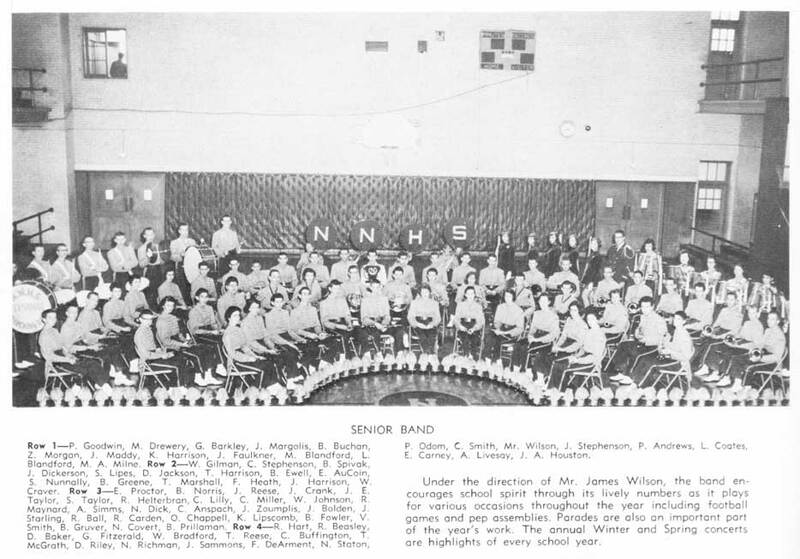 "These girls add color to the Senior Band by their performances during football games and pep assemblies. A flagtwirler spends many hours of tedious work and practice in perfecting her skill." Chuck was one of the best if not the best trumpet player to grace the halls of NNHS. Guys like me and Van Rowell ('65 - of NC) were decent, but Chuck was off-the-charts fabulous. We were no where close to him. As a follow-on to your stunning Junior Band portrait in the 1961 Anchor, I opened my 1960 Anchor and this picture fell out. As the Blues Brother exclaimed in their moment of enlightenment, "THE BAND!" This "official" photo shows the musical trio of (from left): me, the classy Bill Gruver (’62 - of Northern VA, like me, a Preacher's Kid [PK]) and always energetic Solo Trombone First Chair Bill Prillaman (’60, matriculated at VPI) decked out in our white dinner jackets, pegged pants and Penny Loafers. Sorry you can't see the late Verlin Smith ('61), Billy Fowler ('61, he drove a great Studebaker), and Ken Lipscomb ('63 - of Northern VA), who comprised the T-Bone section. 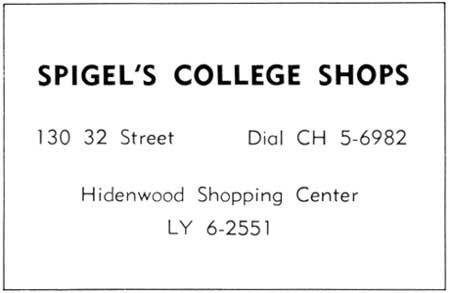 Trombone Trip playing, "Trio for Trombones"
We were outfitted at Spigel's, just around the corner from Washington Avenue on 32nd Street (across from Nachman’s). Memory fails me on the name of the wonderful old guy who fitted us. The indefatigable James P. Wilson directed the Typhoon Marching Band in this picture of the Spring 1960 concert. We played an arrangement called, Trio for Trombones. Also, identifiable in the pictures include (far left): Mary Ann Milne (’60) on flute and (center) Wally Craver (’60) on tenor saxophone. We were privileged to be part of a terrific band -- both musically and as a marching unit. As in 1961, we met each weekday morning at 7:45 a.m. and practiced our routines for the football halftime shows, parades and concerts. 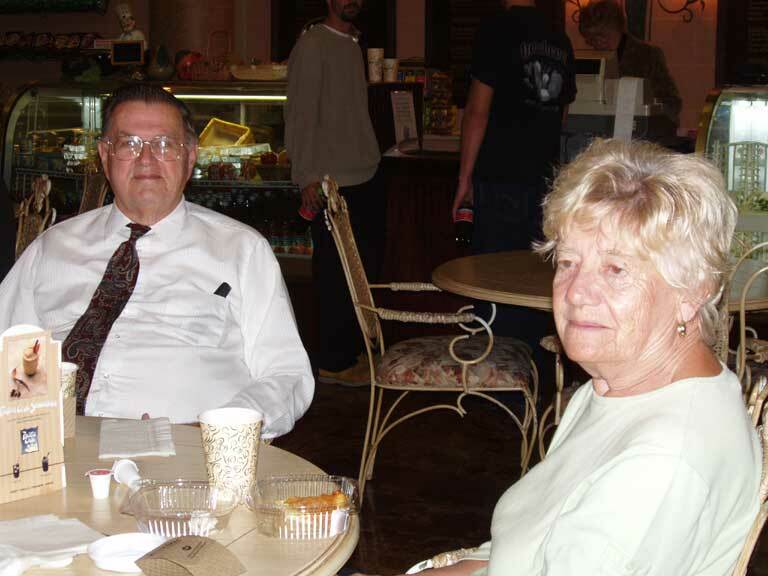 Several of us, including Drummer Donnie Baker (’61) met early for a light breakfast at the Dog House on 29th Street before heading down to the daily rehearsals. Thanks James P., wherever you are. 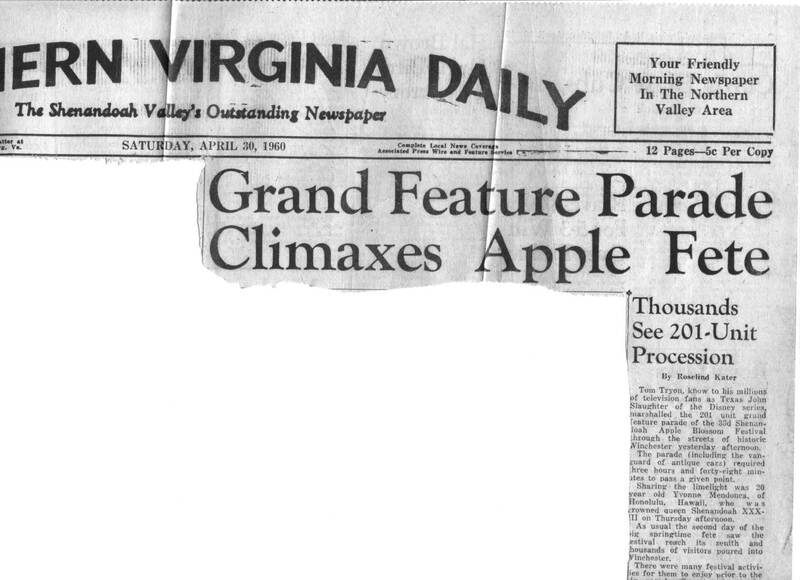 In case you’d like to add to the band site for 1960, here are two views of the Winchester Northern Virginia Daily (Saturday, April 30, 1960) and its front page coverage of the Apple Blossom Parade and list of winners. 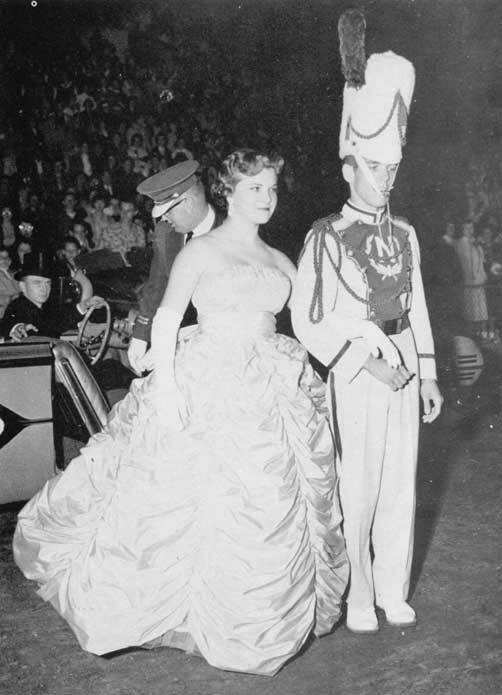 The Band featured its signature song, “Entrance and March of the Charioteers” from the movie “Ben Hur.” The Band did a full-front formation along the South goal line with that music to open the 1961 halftime shows. 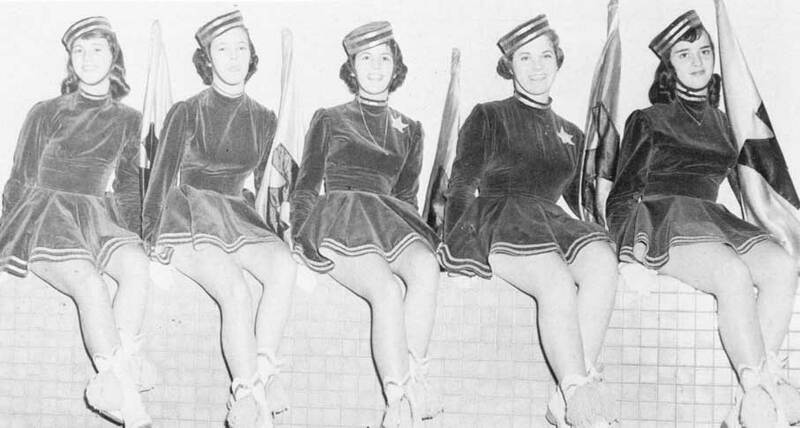 As a side note, my brother, Harry Covert, Jr. (’57) used to take his little brother along with the “guys.” Sitting with them in the stadium, I fell in love with the distaff musicians and beautiful flag twirlers from 1955-57. They thought it was cute when I blushed. Only the special ladies get that from me (but don’t tell anyone). 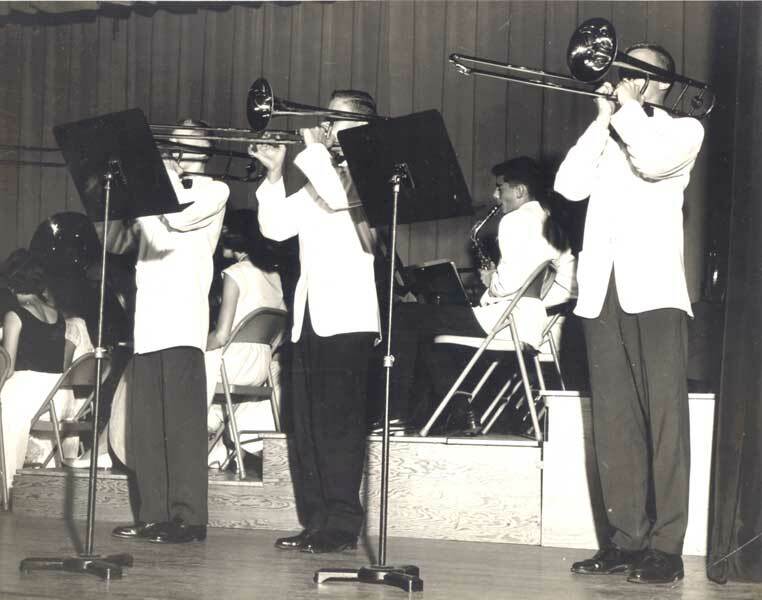 The photo of the trombone trio forwarded a few days ago was probably taken May 28, 1959, not 1960 as originally claimed.